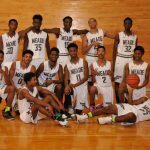 Tuesday, December 5, 2017 4:00 PM Meade High School AWAY 84 @ Chesapeake Science Point HOME 39 Game Recap Meade wins season opener and is now (1-0). Saturday, March 4, 2017 12:00 PM Annapolis High School AWAY 59 Meade High School HOME 55 Game Recap Meade’s season ends with a record of 19-7. Thursday, March 2, 2017 7:00 PM Meade High School AWAY 50 Old Mill Senior High School HOME 46 Game Recap Meade improves to 19-6 and will host the 4A East Region Final Saturday at 12PM. Tuesday, February 28, 2017 6:00 PM Glen Burnie High School AWAY 54 Meade High School HOME 66 Game Recap Meade improves to 18-6 overall and will play in the MPSSAA 4A Section I Final on Thursday. Tuesday, February 21, 2017 5:00 PM Old Mill AWAY 57 Meade High School HOME 54 Game Recap Meade is now 17-6 overall and the #2 seed in the MPSSAA 4A East Region Playoffs. Meade will play the winner of Glen Burnie vs. Severna Park next Tuesday, February 28 at 6PM.